Why Should I Consider Buying a Control Surface? The advent of computer-based recording has been great for streamlining the amount of physical gear an engineer needs to record and mix a project. Traditionally, mixing involved rigging up your console to a multitrack to perform fader moves and such. 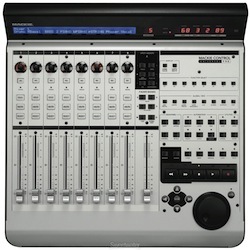 With DAWs, virtually every function of a traditional console can be handled on-screen by drawing automation in or performing fader moves by dragging virtual faders with the mouse. But if you prefer the feel of an analog console and want to work on several tracks in one pass, a mouse doesn’t quite cut it. A control surface is perfect, because it provides the familiar, hands-on feel of a mixer. Even if you didn’t hone your skills in the analog world, some engineers just prefer to use physical faders and knobs, because they feel that it provides better control for smoother fades and automation moves. What Are All These Faders, Knobs, and Buttons For? 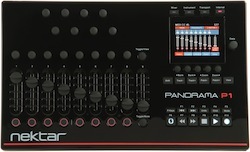 A control surface will normally be equipped with faders; rotaries to adjust panning and other parameters; and controls to start, stop, and locate within the playback. Most control surfaces offer access to advanced functionality such as EQ and dynamics plug-ins if the tracks you’re working with have those plug-ins instantiated. Many of the current control surfaces feature touch-sensitive/motorized faders that update seamlessly and provide a great visual aid when looking at your levels. Although infinite rotary encoders are standard issue on modern controllers, you may occasionally find traditional knobs onboard as well. Rotary encoders can handle any number of functions and are typically assignable. For example, you could assign a channel pan to a rotary encoder and set the pan wherever you wish. When you come back to that track, the encoder will know where it was set, and future adjustments will be updates to its previous position. A knob has a designated travel path and typically has set values. If the pan was set using a knob rather than a rotary encoder, upon coming back to a track, the software would show the correct pan value, but the knob could possibly be showing a different value. Transport controls are another important feature that should be included on a control surface. They let you start and stop playback or recording, as well as fast forward and rewind tracks. This is great, because it maintains the mouse-free convenience, provided by a control surface, and minimizes the use of the computer keyboard. Banks refer to groups of faders. These faders normally come in groups of eight. The eight faders correspond to eight sequential tracks in your DAW. Using the aptly titled Bank Select button, you can specify whether you want to work on tracks 1-8, or 9-16, of other banks. The great thing about banks is that you can stay in the sweet spot for mixing yet still have fader control over any track you need. Whether you’re working on a kick drum on channel one or a guitar overdub on channel 28, you never have to leave the mix position. Most control surfaces are just devices that provide control over your software. There are a few manufacturers, however, that offer full-fledged analog or digital consoles (complete with I/O, mic preamps, and other customary console functions), which also provide flexible DAW-control functionality. If you want your control surface to function as an audio interface or a traditional console, make sure that it includes the number and type of inputs you need: XLR mic inputs, 1/4″ line, etc. 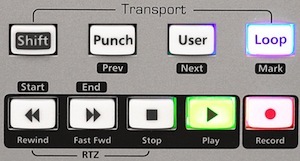 Most control surfaces use MIDI to send control information to and from your DAW computer. USB is commonly found on control surfaces as the primary means of connecting to a DAW, but there are also surfaces that use FireWire, Ethernet, and proprietary protocols. Will It Work with Your Software and Hardware? Most control surfaces are pretty flexible in terms of software compatibility, but there are exceptions, so it’s best to check this in advance. On the hardware side of things, if you’re planning to upgrade your computer soon, make sure that the primary connections of the control surface are available on both your existing system and your new one. How Many Faders/Fader Banks Do You Need? While most surfaces are equipped with eight faders, many are expandable with additional control surfaces. If your software tracks top out at 32, an 8-fader surface with four banks will handle your fader needs nicely. A couple of manufacturers are making devices that sport a single motorized fader and perhaps a knob for panning and transport controls. This modest expansion is an inexpensive way to enhance your productivity, provided you only want to write automation on one track at a time. Connectivity protocol: USB, FireWire, Ethernet, etc.